Late last year I filled out an online volunteer registration form for Vegas PBS. 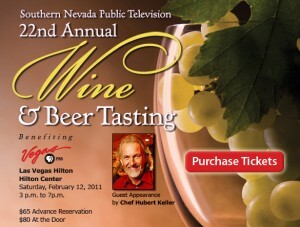 When they contacted me to volunteer at their recent 22nd Annual Wine & Beer Tasting benefit, I jumped at the chance. Hey, I know a little bit about wine and the chance to taste over sixty-five different wines and beers in exchange for a couple of hours of easy work sounded like a fair deal. Although attendance was down a bit from previous years, the evening was still a big success. The PBS staff and other volunteers were pleasant and very fun to work with. The wine auction, together with the silent auction on things ranging from a lunch with the Mayor of Las Vegas, Oscar Goodman, to a pair of diamond earrings attracted competitive bidders and went off without a hitch. The next volunteer opportunity at Vegas PBS is going to be their on-air Spring Pledge Drive, March 4-13. Several local businesses have already pledged volunteer support for the pledge phones, but these are fun, team-building, get-to-know-new-people-events and anyone interested in volunteering should contact Susan Johnson at (702) 799-1010 x5361. Vegas PBS is going to follow the model they pioneered last year of limited program breaks during the pledge drive. But you’ll still have a chance to wave to friends and family on-air during the shorter ten minute segments! If answering phones during a pledge drive isn’t for you, there are many different opportunities to get involved at Vegas PBS, including once a week help around the office and in the studio. Aside from two more pledge drives this summer, they’re going to need about forty volunteers for the 2nd Annual Vegas PBS 5k Run scheduled for October 8, 2011. Call Susan for more information about these and other upcoming benefits and events. For those who may have glossed over their public television options recently, Southern Nevada Public Television, aka Vegas PBS is not all “Sesame Street” and political commentary. Sure, mainstay programs like “The Nightly Business Report” and “Nevada Week in Review” and “Washington Week” still provide important and valuable information on what’s going on in our world at large. But other programs, like “Wonders of the West” and “Outdoor Nevada” compliment nationally syndicated PBS programming like “Nova”, “Antiques Roadshow” and “The American Experience”. Even more relevant and closer to home for many of us, Vegas PBS offers an impressive array of on-line and virtual education courses both for adults and for school kids K-thru-12. For instance, the Homework Hotline (702) 799-5111, where Clark County teachers host an hour-long call-in show and provide helpful instruction on tough homework assignments is offered Monday-Thursdays during the school year. (Students can call in their questions before, during and after the program.) The Vegas Virtual Workforce Training courses is another of the many valuable program resources available to all Nevada residents. Check it out. You’ll probably be surprised at what is available to you. In a time of budget cutting and political finger pointing, it’s nice to see a well run, low-cost/high-value community resource that offers something for everyone. Getting involved with Vegas PBS has renewed my confidence in the future of Las Vegas. If you’re tired of feeling cynical about the place you live, I suggest you try getting involved too.